Established in 2015 located in the trendy Westboro Village, The Barley Mow Westboro is the newest addition to the family. From fresh in house food, roof top patio, private dinning room and live entertainment this pub has what you are looking for! We will be DONATING $1 from every order of zucchini sticks and $1 from each 1,000 Island Brewery beer sold during the month of April at our ALMONTE & BROCKVILLE locations. For same day reservations OR reservations of more than 10 people please contact us. 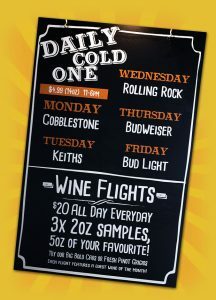 CHECK OUT our specials like the "Daily Cold One"! Please check back soon for job opportunities. To submit your resume please email to: kelly@barleymow.com. From comfort food to contemporary dishes, we offer an extensive menu. 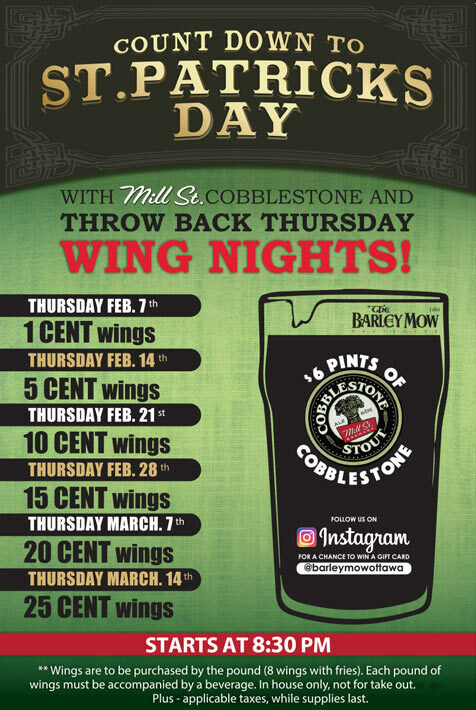 For daily specials, wing nights, and happy hour check your favourite Barley Mow Pub location! We feature live bands and nightly entertainment on weekends at most of our Ottawa and Brockville pub locations. GIFT CARDS AVAILABLE AT ALL BARLEY MOW LOCATIONS! Treat your family and friends to fresh food, cold beverages and a great atmosphere with our gift cards.